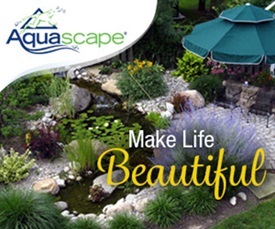 February is finally here and that means we’re one month closer to spring! Our winter has been pretty snowy and cold so far and rather than let it get me down, I’ve invested time indoors to making more projects than usual. 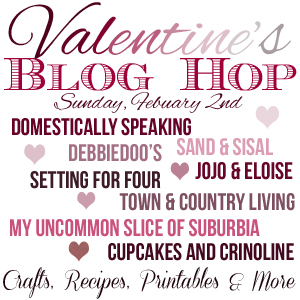 Today I’m joining several other bloggers for a Valentine’s blog hop where we’re all sharing Valentine inspiration (see links at end of post). 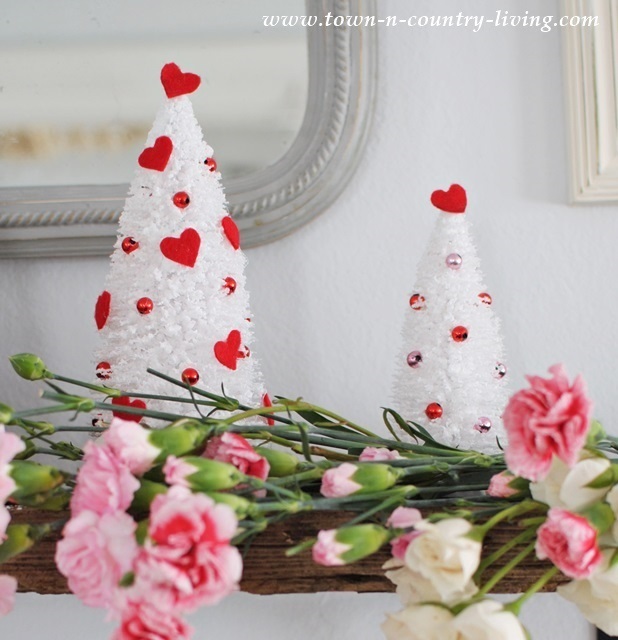 I’m going to show you how to make Valentine bottle brush trees. 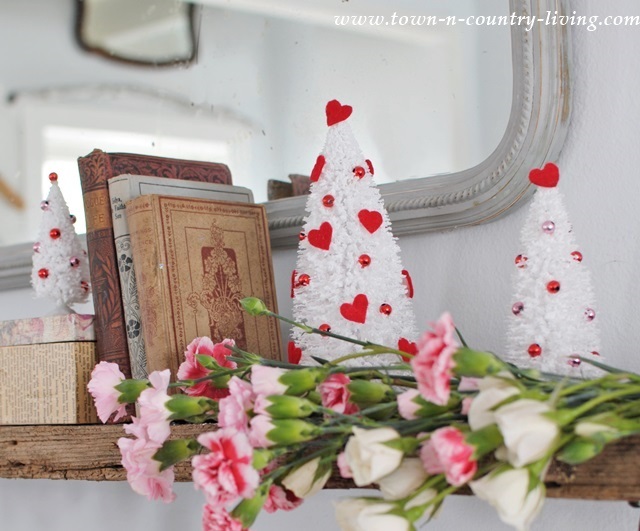 Christmas seems to be the time that bottle brush trees make their appearance, but why not Valentine’s Day too? I was so happy to find white bottle brush trees for half price shortly after Christmas. Since they’re white, I didn’t have to bleach them first like I did for Christmas. Plus they’re a brighter white than the bleached version. I cut out little red felt hearts and found pink and red glass beads. 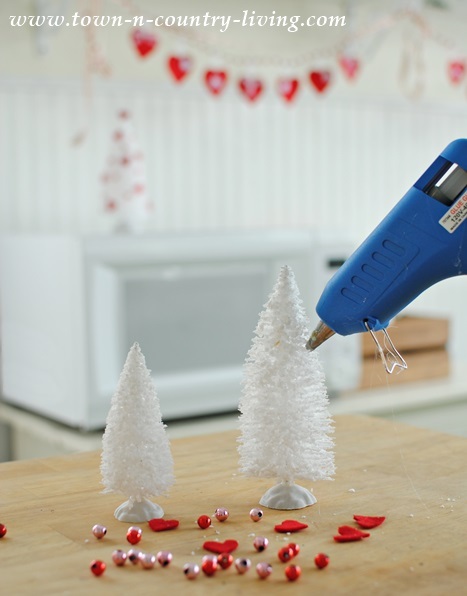 Use a hot glue gun to adhere the decorations onto the tree. I glued the hearts on first, then added the little glass beads. This was a fast and easy Valentine’s Day project. 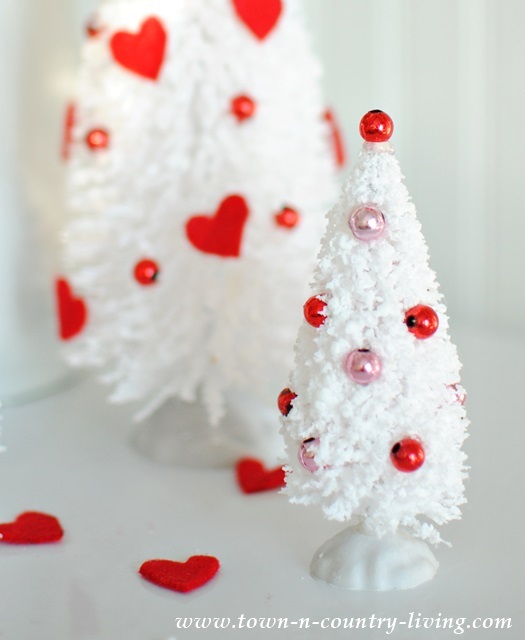 The smallest of the Valentine bottle brush trees wears beads only. 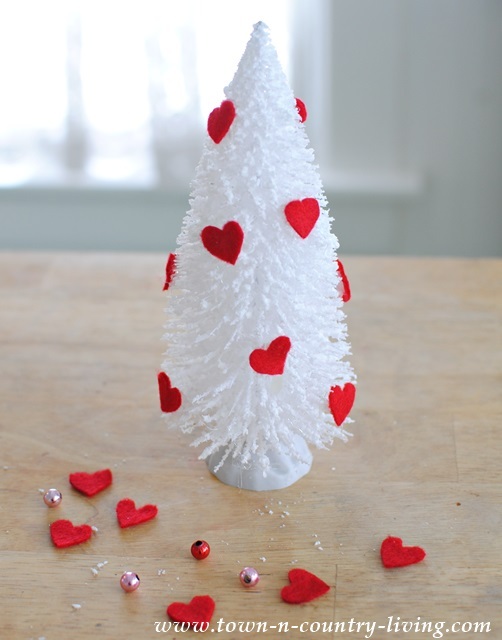 Since I keep making more Valentine crafts, I’ve been moving my Valentine bottle brush trees around a lot. Don’t they look pretty with the pink and white carnations and spray roses? 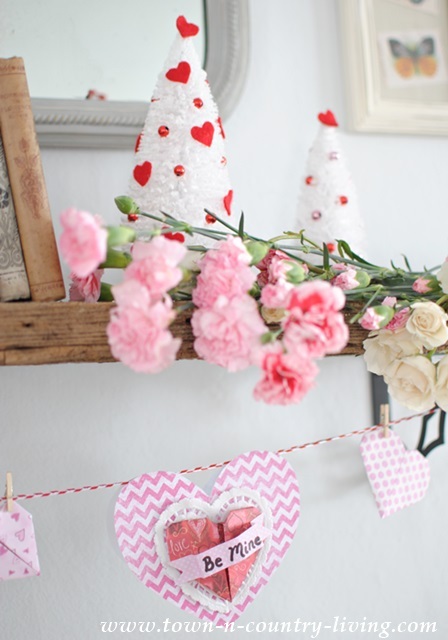 The Valentine heart garland was made a couple weeks ago. 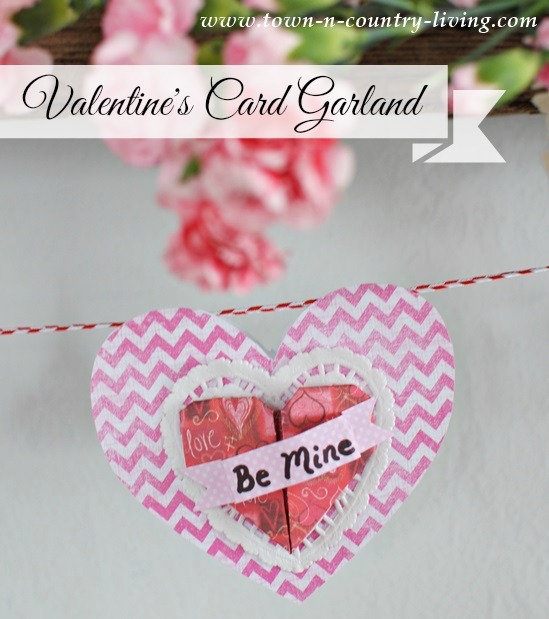 What Valentine crafts have you made so far? 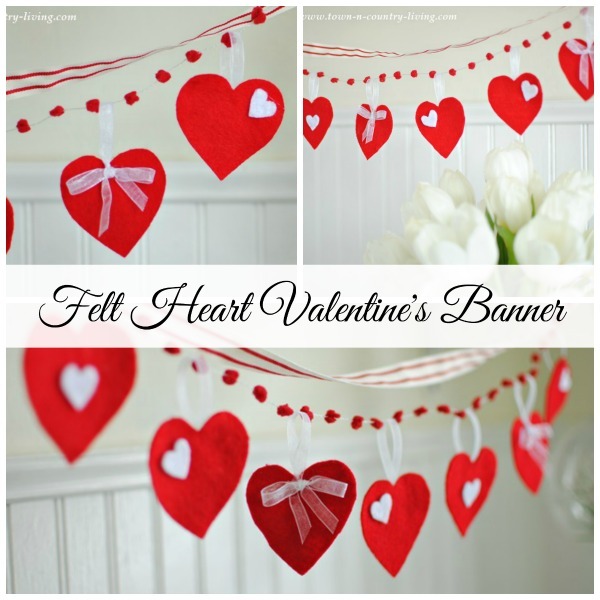 Here are more Valentine’s Day craft tutorials for you! 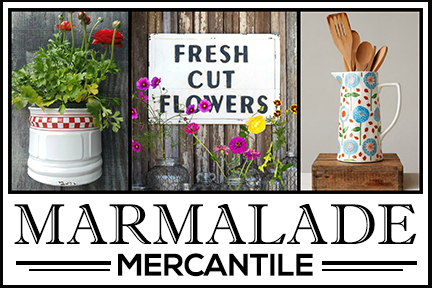 Be sure to visit the other bloggers today for more Valentine’s Day inspiration! Cute!! I love your mantel, the flowers are such a pretty touch! Oh too cute for words! 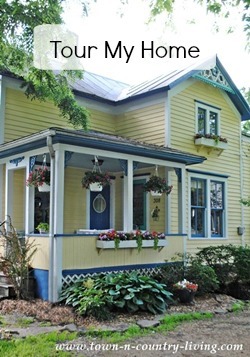 Love your mantel too! These trees are so sweet, Jennifer. I have some of those white ones that are sparkly and would be cute done this way. 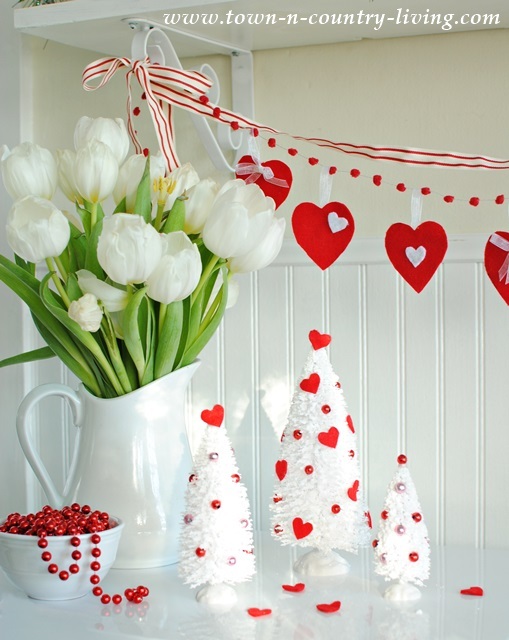 We’ll be away for Valentine’s so I won’t do them but I have a few decorations out to enjoy beforehand. Have a nice week! This is super sweet. 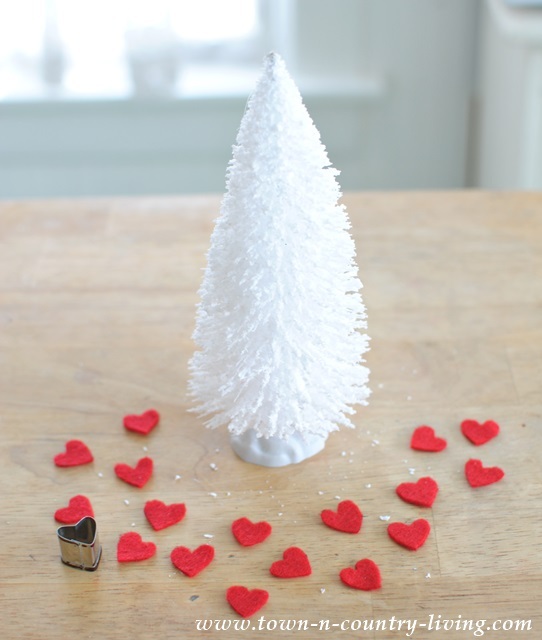 Love the little valentine trees. Too cute. 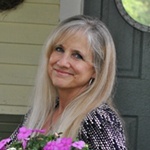 Jennifer your trees are so sweet! What a fun craft. My girls would love making these. Those are so cute!! I have a ton of bottle brush trees but only use them at Christmas. I’m sorry I packed mine away now! I must say the trees are delightful! Perfect for a “holiday” that falls in winter. The bright white trees and red and pink are so bright and cheery! The flowers complimemt your mantle so well, too. These are so darling! Great idea. Please, oh please use dear St. Valentine’s title of Saint of the Catholic chuch and a bishop. Everyone uses the title of the feastday of St. Patrick so please render St. Valentine the same honour. With gratitude and joy and Happy St. Valentine’s Day 2014.